Follicular Th (TFH) cells are specialized in provision of help to B cells that is essential for promoting protective Ab responses. CD28/B7 (B7-1 and B7-2) interactions are required for germinal center (GC) formation, but it is not clear if they simply support activation of naive CD4 T cells during initiation of responses by dendritic cells or if they directly control TFH cells and/or directly influence follicular B cell differentiation. Using a model of vaccinia virus infection, we show that B7-2 but not B7-1 deficiency profoundly impaired TFH cell development but did not affect CD4 T cell priming and Th1 differentiation. Consistent with this, B7-2 but not B7-1 was required for acquisition of GC B cell phenotype, plasma cell generation, and virus-specific neutralizing Ab responses. 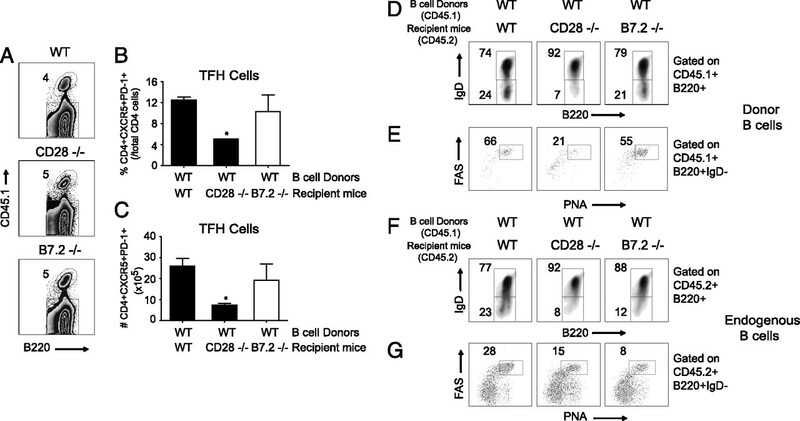 Mixed adoptive transfer experiments indicated that bidirectional interactions between CD28 expressed on activated T cells and B7-2 expressed on follicular B cells were essential for maintenance of the TFH phenotype and GC B cell development. Our data provide new insight into the source and nature of molecules required for TFH cells to direct GC B cell responses. Vaccinia virus (VACV) is a large DNA virus that belongs to the genus Orthopoxviridae, which include variola, monkeypox, buffalopox, and cowpox. VACV immunization provides protection against variola virus, the causative agent of smallpox, and stands as the classic example of a successful vaccine (1, 2). Humans and mice make neutralizing Abs against both intracellular mature virion and extracellular enveloped virus vaccinia virion forms (1, 2). Ab responses to VACV are almost completely CD4 T cell-dependent, with a minor T cell-independent IgM response (3, 4). Although it is clear that neutralizing Abs are a very potent mechanism for protection against orthopoxviruses, the exact immune mechanisms that lead to the generation and maintenance of VACV-specific Ab-mediated protection are not completely understood. Initiation and regulation of T cell-dependent B cell responses require a potentially complex network of signals. In general, upon immunization or infection, naive CD4 T cell activation is mediated in T cell zones of secondary lymphoid organs by recognition of Ag expressed on dendritic cells (DCs) (5). Naive B cells also encounter Ag in lymphoid tissues, move to the boundary between B cell follicles and T cell zones, and engage in cognate interactions with a distinct and specialized Ag-specific CD4+ T cell called follicular Th (TFH) cell that is formed several days after initial activation of naive T cells (6, 7). These secondary interactions are thought to determine the fate of both B and TFH cells. Activated B cells can either move into extrafollicular areas and terminally differentiate into short-lived plasma cells that secrete low affinity Ab for a few days or move into B cell follicles and form highly specialized structures called germinal centers (GCs) (7–9). It has been postulated that at this early developmental juncture, TFH cells also require signals from the Ag-primed B cells to further differentiate and migrate into the follicular GC as GC-associated TFH (GC TFH) cells (7, 9–12). There is emerging evidence that GC TFH cells ensure only those activated GC B cells with highest affinity for a given Ag will survive and differentiate to become long-lived plasma cells or memory B cells (7). One important aspect of the GC reaction that is not well understood is the directionality, and possible bidirectionality, of signaling through specific receptor–ligand interactions between TFH and B cells (13). Several molecular interactions have been reported to control GC development including those between the Ig superfamily members, CD28 and ICOS, expressed on CD4 T cells and their ligands B7-1 (CD80) and B7-2 (CD86) or ICOS ligand that can be expressed on APCs including DCs and B cells (13). Mice deficient in CD28, or both B7-1 (CD80) and B7-2 (CD86), have been shown to be severely impaired in mounting GC reactions and Ab responses after protein immunization (14–16) and postinfection with a number of viruses (murine γ-herpesvirus 68, vesicular stomatitis virus, HSV, influenza) (17–20). Because initial activation of CD4 T cells is generally impaired in the absence of these molecules, reflecting roles during naive T cell and DC communication, it has not been possible to determine whether CD28 signals are also required for TFH lineage commitment and/or whether B cell autonomous expression of B7-1/B7-2 plays a role in the GC reaction. Using experimental VACV infection in mice, we found we could selectively differentiate alternate steps in GC development and specifically distinguish whether CD28/B7 interactions regulate TFH communication with follicular B cells. We show that in the absence of B7-2, B7-1 can provide the required costimulatory signals that lead to CD4 T cell activation and Th1 differentiation. However, expression of B7-1 is not sufficient for optimal TFH development and subsequent GC B and extrafollicular plasma cell differentiation. Adoptive transfer experiments indicated that B cell-autonomous expression of B7-2 is required for TFH development and acquisition of GC B cell phenotype, indicating that ligation of B7-2 on B cells is essential for the production of class-switched Ab. The studies reported in this study conform to the Animal Welfare Act and the National Institutes of Health guidelines for the care and use of animals in biomedical research. All experiments were done in compliance with the regulations of the La Jolla Institute Animal Care Committee in accordance with the guidelines by the Association for Assessment and Accreditation of Laboratory Animal Care. Eight- to 12-wk-old female C57BL/6, CD28−/−, B7-1−/−, and B7-2−/− were purchased from The Jackson Laboratory. B7-1/B7-2 double-deficient mice were kindly provided by Dr. A. Sharpe (Harvard Medical School). VACV peptide epitopes (A18R49–63, A20R233–247, A24R402–416, A28L10–24, D13L486–500, D8L238–252, E1L117–193, E9L179–193, F15L55–69, H3L272–286, I1L21–35, I1L7–21, J4R78–92, and L4R176–190) used in this study were predicted and synthesized as described previously (21). Hybridomas were cultured in protein-free hybridoma medium-II (Invitrogen), and mAbs were isolated by dialysis of supernatant. To block B7-1 and/or B7-2, 150 μg anti–B7-1 (clone 16-10A1), anti–B7-2 (clone GL1), and/or control Ab was given i.p. on days 0–3 postinfection with VACV. VACV was prepared as described before (22). Briefly, HeLa cells were infected with 1.0 × 107 PFU VACV Western Reserve (VACV-WR; American Type Culture Collection) in 2.5 ml volume (T175) for 1 h at 37°C. A total of 20 ml media was added, and cells were incubated at 37°C for 2 d. Cells were harvested by scraping flask, centrifuged at 1800 rpm for 6 min, and washed with PBS. The pellet was resuspended in 2.5 ml RPMI with 1% FCS. The virus was freed from cells by freezing cells in a dry ice-ethanol bath and rapid thaw at 37°C in water bath. This was repeated three times, and cells were vortexed between cycles. Cells were centrifuged at 2000 rpm for 8 min to remove cell debris. The viral supernatant was stored at −80°C. The virus titer was measured by performing plaque assays on VeroE6 cells. Following virus titration, virus was diluted to 4 × 108 PFU/ml in PBS. For most experiments, mice were infected with 2.5 × 105 PFU VACV-WR by bilateral i.p. injections. GC reaction, plasma cell differentiation, CD4 T cell and TFH development, and VACV-specific Ab responses were analyzed on days 8, 15, and 35 postinfection. Spleens were aseptically removed from euthanized mice, and single-cell suspensions were prepared by mechanically dispersing the tissues through 70-μm cell strainers (Falcon BD Labware) into HBSS. Following RBC lysis, cells were stained with anti-Fc II/III receptor mAb 2.4G2 for 15 min at 4°C. Cells were washed with FACS buffer (PBS and 2% FCS), and GC B cells were analyzed by staining splenocytes with anti-mouse IgD (biotin; Southern Biotechnology Associates), B220 (PerCP; BD Pharmingen), PNA (FITC; Vector Laboratories), and FAS (PE; BD Pharmingen) for 30 min at 4°C. Cells were washed and subsequently stained with streptavidin-APC (Invitrogen) for 30 min at 4°C. Cells were analyzed on FACSCalibur flow cytometer. In some experiments, B7-1 and B7-2 cell-surface expression was assessed on B220+ B lymphocytes after staining with B7-1 (PE; eBioscience) and B7-2 (PE; BD Pharmingen). TFH and plasma cell staining. Surface staining was done with following Abs: B220 (RA6-6B2) (PerCP [BD Pharmingen] or APC [eBioscience]), CD62L (MEL-14; eBioscience), CD44 (IM7; eBioscience), SLAM (TC15-12F12.2, Biolegend), CD4 (RM4-5) (PerCP [BD Pharmingen] or APC eFluor780 [eBioscience]), CD8 (53-6.7; BD Pharmingen), IgD (11-26; eBioscience), PD-1 (J43; eBioscience), and CD138 (281-2; RDI). CXCR5 staining was done as a three-step stain, as published (12) using purified rat anti-mouse CXCR5 (BD Pharmingen) followed by biotinylated anti-rat IgG (Jackson ImmunoResearch Laboratories) in PBS/0.5% BSA/2% FCS/2% normal mouse serum on ice. For tertiary staining of CXCR5, PE or APC-labeled streptavidin (Caltag Laboratories) was used in PBS/0.5% BSA/2% FCS. Samples were acquired on an FACSCanto II or LSR II (BD Biosciences) and analyzed using FlowJo (Tree Star). Cytokine production in CD4 T cells was assessed as previously described (22, 23) with some modifications. Briefly, after lysing RBCs, splenocytes from infected mice were resuspended in RPMI 1640 medium (Invitrogen) supplemented with 10% FCS (Ω Scientific), 1% L-glutamine (Invitrogen), 100 μg/ml streptomycin, 100 U/ml penicillin, and 50 μM 2-ME (Sigma-Aldrich). Cells were plated in round-bottom 96-well microtiter plates in 200 μl with medium or the indicated MHC class II-restricted VACV peptide epitopes (A18R49–63, A20R233–247, A24R402–416, A28L10–24, D13L486–500, D8L238–252, E1L117–193, E9L179–193, F15L55–69, H3L272–286, I1L21–35, I1L7–21, J4R78–92, and L4R176–190) at 10 μg/ml for 1 h at 37°C. GolgiPlug (BD Biosciences) was then added to the cultures according to the manufacturer’s instructions, and the incubation was continued for 8 h. Cells were stained with anti-CD4 (PerCP; BD Pharmingen) and anti-CD62L (PE; BD Pharmingen) followed by fixation with Cytofix-Cytoperm (BD Biosciences) for 20 min at 4°C. Fixed cells were subjected to intracellular cytokine staining in Perm/wash buffer (BD Biosciences) for 30 min at 4°C. Cells were stained with anti–IFN-γ (eBioscience) for 30 min at 4°C. Samples were analyzed for their proportion of cytoplasmic cytokines after gating on CD4+ CD62L-low T cells by FACSCalibur flow cytometer (BD Biosciences) using CellQuest and FlowJo software (Tree Star). Serum was obtained after centrifugation of blood samples collected with a heparinized capillary pipette from the retro-orbital plexus. All samples were stored at −20°C until analyzed for Ab activity. The level of specific Abs against VACV in serum was quantitated by an ELISA as previously described (4, 24). VeroE6 cells were seeded at 1.5 × 105 cells/well into 24-well Costar Plates (Corning, Corning, NY). On the same day, serum was inactivated at 56°C for 1 h and incubated with 50 μl freshly sonicated VACV-WR (3 × 104 PFU/ml) overnight at 37°C. For controls, multiple wells of VACV-WR alone were also used. The cells were used the following day at 80–90% confluency. Medium was discarded from 24-well plate wells, and cells were infected with serum-virus samples at 37°C for 1 h. Following the infection, 1 ml complete DMEM was added to each well, and cells were incubated at 37°C for 48 h. Cells were washed with warm PBS, fixed, and stained with 0.1% crystal violet in 25% reagent alcohol (90% ethanol, 5% methanol, 5% isopropanol), and plaques were quantified. To quantify VACV-neutralizing Abs, a 50% plaque reduction number titer (PRNT50) approach was used in which the Ab sample of interest was serially diluted two times prior to incubation with VACV. The neutralization titer (PRNT50) was defined as the reciprocal of the last dilution of the plasma that reduced the average number of plaques by 50% compared with the mean number of VACV-alone plaques. Single spleen cell suspensions from wild-type (WT) (CD45.1 or CD45.2 congenic mice) and gene-deficient (CD45.2) mice were prepared as described above. CD19+ B lymphocytes were enriched by positive selection using Miltenyi Biotec microbeads as per the manufacturer’s instructions (Miltenyi Biotec). For adoptive transfers, 3 × 107 highly purified (>99%) CD19+ B lymphocytes from naive WT (CD45.1) mice were transferred by i.v. injection into CD28−/−, B7-1−/−, B7-2−/−, or B7-1.2−/− mice as indicated. In some experiments, CD19+ B lymphocytes from WT or B7-1.2−/− were transferred into WT mice. One day later, mice were infected with VACV-WR, and TFH development, GC responses, and plasma cell differentiation were analyzed on days 8 or 15 postinfection. VACV-immune or control serum was prepared from naive (WT) mice and CD28−/−, B7-1−/−, B7-2−/−, and B7-1.2−/− mice that were previously infected (i.p) with VACV-WR (2 × 105 PFU/mouse). Age-matched naive WT C57/BL6 mice were injected i.p with 400 μl serum from the indicated gene-deficient mice. The following day, mice were anesthetized by inhalation of isoflurane and inoculated by the intranasal (i.n.) route with 1 × 106 PFU VACV-WR. Mice were weighed daily for 1 wk following challenge and were euthanized when they lost 25–30% of their initial body weight. Body weight was calculated as percentage of the mean weight for each group on the day of challenge. Statistical significance was analyzed by Student t test. Unless otherwise indicated, data represent the mean ± SEM, with p < 0.05 considered statistically significant. The role of CD28 and its two natural ligands, B7-1 (CD80) and B7-2 (CD86), in the development of pre-GC (TFH) and GC TFH cells was examined in CD28−/−, B7-1−/−, B7-2−/−, and B7-1/2 double-deficient mice that were infected with VACV-WR strain. TFH cells can be distinguished from other CD4 T cell subsets by the coexpression of CXCR5, programmed cell death 1 (PD-1), and ICOS molecule (ICOS) (9, 25–27). GC-associated TFH cells are further differentiated TFH cells that express the highest levels of Bcl6 and CXCR5 in mouse CD4 T cells (10, 28). GC TFH cells are most frequently identified by their coexpression of CXCR5 and high expression of PD-1 or the GL-7 epitope (10, 29), allowing for further distinction between TFH and GC TFH populations. The VACV-specific CD4 T cell response in the spleen of mice peaks between 8 and 10 d postinfection and wanes dramatically by day 30 (30). Spleen cells were collected on day 8 postinfection and analyzed for TFH and GC TFH. Substantial numbers of TFH (CXCR5+PD-1+; Fig. 1A) and GC TFH (CXCR5+GL-7+; Fig. 1B) cells were induced postinfection. In B7-2–deficient mice, the frequency of TFH cells was strongly reduced, and B7-2−/− mice also exhibited a more striking reduction in GC TFH numbers, producing <10% of WT levels. In contrast, in the absence of B7-1, the percentage and absolute numbers of pre-GC or GC TFH cells were comparable with WT mice. To determine whether the low numbers of TFH cells that developed in B7-2−/− mice were due to B7-1, we also examined T cell responses in B7-1/2 double-deficient mice. There was a profound impairment of TFH cells, with <1% of WT numbers, a phenotype that was largely recapitulated in CD28−/− mice. B7-2 is required for optimal development of TFH but not Th1 cells in response to VACV. WT, CD28−/−, B7-1−/−, B7-2−/−, and B7-1.2−/− mice were infected i.p with VACV-WR (2 × 105 PFU/mouse). Naive mice were used as control. At day 8 postinfection, splenic mononuclear cells were harvested and stained for CD4, CD44, CD62L, CXCR5, PD-1, and GL-7. Representative contour plots depicting TFH (CXCR5+PD-1+) (A, left panels) and GC TFH (CXCR5+GL-7+) cells (B, left panels) after gating on CD4+CD44highCD62Llow cells. Numbers indicate percentages of CXCR5+PD-1+ and CXCR5+GL-7+–positive cells within the gated population. Total numbers of TFH and GC TFH cells per spleen, determined as described in Materials and Methods (A, B, right panel). Each symbol represents one mouse. C, Representative contour plots depicting activated T cells (CD44highCD62Llow) cells after gating on CD4+ cells. Total percentages ± SEM of CD44highCD62Llow T cells per spleen from four individual mice (C, right panel). Each symbol represents one mouse. D, On day 8 postinfection, IFN-γ– and TNF-secreting CD4 T cells were assessed by intracellular cytokine staining after stimulation with pool of VACV peptides. E, Total numbers ± SEM of CD4+IFN-γ+ (left panel) and CD4+TNF+ (right panel) T cells per spleen from four individual mice. Each symbol represents one mouse. Similar results were obtained in three separate experiments. *p < 0.05 (WT versus gene-deficient). To distinguish between an effect of CD28 interacting with B7-2 on naive CD4 T cell priming as opposed to a later activity regulating acquisition of the TFH phenotype, splenocytes were collected before (naive mice) or on day 8 postinfection and analyzed for expression of activation markers (CD44 and CD62L) and intracellular IFN-γ and TNF production (21). In CD28−/− and B7-1/2 double-deficient mice, the percentage and numbers of effector CD4 T cells that produced IFN-γ or TNF in response to VACV were substantially reduced (Fig. 1D). However, B7-2 deficiency alone had a relatively minor effect on the absolute numbers of total (data not shown) and activated (CD44-high/CD62L-low) CD4 T cells (Fig. 1C). There was also little difference between B7-1– and B7-2–deficient mice and WT controls in the percentage or numbers of CD4 T cells that produced IFN-γ or TNF in response to VACV peptides (Fig. 1D). These results reveal that early in the response to VACV, likely at the level of T–DC interaction, both B7-1 or B7-2 ligand interactions provide the required costimulatory signals that lead to optimal CD4 T cell activation and Th1 differentiation. However, because of the differential effect on TFH observed in B7-2−/− mice, the results imply that B7-2 at a later stage becomes the primary CD28 ligand required for acquisition or maintenance of the TFH phenotype and lineage commitment to GC TFH cells. To further dissect this, development of GC B cells and plasma cells was assessed. Cognate interaction between Ag-specific B cells and TFH cells at the T–B borders of lymphoid organs can lead to two developmental pathways to which activated B cells commit: 1) protective Ab production via the GC reaction; and 2) extrafollicular differentiation to Ab-secreting plasma cells. In our preliminary experiments, the GC (PNA+FAS+) B cells appeared in the spleen as early as day 8, peaked between days 12 and 15, and disappeared on day 30 after i.p infection with VACV-WR (data not shown). On day 8 postinfection, the frequency of GC B cells (Fig. 2A, 2C, left panel) and B cells positive for the plasma cell differentiation marker CD138 (Syndecan-1) (Fig. 2B, 2C, right panel) were significantly reduced in mice lacking B7-2, CD28, or both B7-1 and B7-2, but significantly not in mice lacking B7-1 alone (Fig. 2A–C). A minor role for B7-1 in acquisition of the GC phenotype was found by a further reduction in the percentage of the GC B cells in B7-1/2−/− mice as compared with B7-2 single-knockout mice. B7-2 is essential for acquisition of GC B cell phenotype and plasma cell differentiation in responses to VACV. WT, CD28−/−, B7-1−/−, B7-2−/−, and B7-1.2−/− mice were infected i.p with VACV-WR (2 × 105 PFU/mouse). At day 8 (A–C) and day 15 (D, E), splenocytes were stained with anti-B220, IgD, PNA, FAS, plus CD138 and the number of GC B and plasma cells calculated. Representative contour plots of gated B220+ cells staining for PNA and FAS (A) and plasma cell differentiation marker CD138 (B) in spleen. Numbers indicate percentages of GC B (PNA+FAS+) and plasma cells (IgDlow/CD138+) after gating on B220+ populations. C, Total numbers of GC B (PNA+FAS+; left panel) and plasma cells (IgDlow/CD138+; right panel) per spleen, determined as described in the Materials and Methods. Each symbol represents one mouse. D, Representative contour plots depicting the expression of IgD on B220+ cells. Percentages of B220+IgD+ and B220+IgD− cells are indicated. E, Representative dot plots showing the expression of PNA+FAS+ within the IgD−B220+ gated population. Percentages of GC (PNA+FAS+) B cells are indicated. F, Groups of WT mice were injected i.p. on days 0–3 with 150 μg control IgG, anti–B7.1-blocking Ab, anti–B7.2-blocking Ab in PBS, or both as indicated. B7-1/2 double-deficient mice were used as positive control. Representative contour plots showing GC staining (FAS+PNA+) after gating on IgD−B220+ cells. Total number of FAS+PNA+ GC B cells within the IgD−B220+ gate is indicated (F, bottom panel). Statistical significance is indicated by asterisks. The p values are <0.05 by two-tailed Student t test. Similar results were obtained in at least four separate experiments. The hallmark of B cell activation and differentiation to GC B cells is the downregulation of IgD expression. On day 15 postinfection with VACV-WR, ∼11% of B220+ cells were IgDlow, which represent activated B cells that initiate a GC reaction (Fig. 2D). The percentage of activated B cells (B220+IgDlow) was significantly reduced in mice lacking B7-2 or both B7-1 and B7-2, but not B7-1 alone (Fig. 2D). Consistent with this, the percentage (Fig. 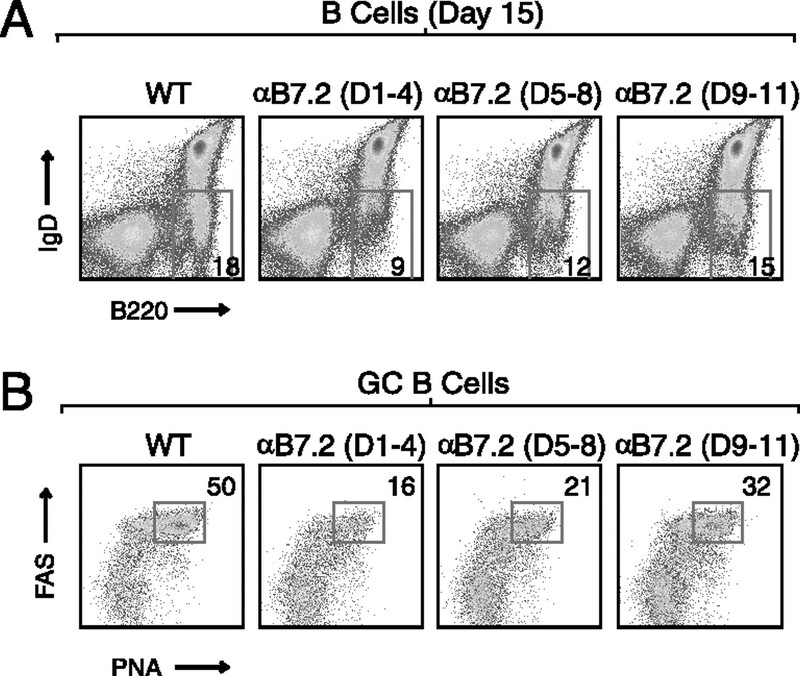 2E) and absolute numbers (not shown) of IgDlow GC B cells (PNA+FAS+) were severely impaired in B7-2−/− and B7-1.2 double-deficient mice but not in B7-1−/− mice. Together, these results demonstrate that B7-2 is the primary CD28 ligand required for development of the GC reaction in response to VACV-WR. To confirm this, the B7-1 and B7-2 ligands were blocked either individually or in combination with nondepleting blocking mAb (Fig. 2F). In common with our knockout data, B7-2 receptor blockade inhibited both percentages (Fig. 2F, top panel) and absolute numbers (Fig. 2F, bottom panel) of GC B cells, whereas blocking B7-1 alone had little or no effect. The defect in GC B cells was further exacerbated when both ligands were blocked, which again were similar to the defect seen in B7-1.2 double-deficient mice. To further examine the role of B7-1 versus B7-2 in the humoral immune response, serum levels of virus-specific Ig were measured on day 15 postinfection. In contrast to B7-1−/− mice, those animals deficient in B7-2, CD28, and B7-1/2 exhibited significantly blunted total VACV-specific IgG levels (Fig. 3A, left panel). The IgG2c subclass is the dominant isotype generated in response to VACV. B7.2−/− mice and to a lesser extent B7.1−/− showed impaired VACV-specific serum IgG2c levels (Fig. 3A, right panel). Comparable levels of VACV-specific IgG1 levels were seen in B7.1−/− mice and WT mice (not shown). In contrast, IgG1 levels were significantly decreased in B7.2−/−, CD28−/−, and B7.1.2−/− mice (not shown). These results show that B7-2 has a dominant role in isotype switching to IgG2c and IgG1 during VACV infection. B7-2 expression is required for Ab class-switched neutralizing Ab response to VACV. WT, CD28−/−, B7.1−/−, B7.2−/−, and B7.1.2−/− mice were infected i.p with VACV-WR (2 × 105 PFU/mouse). A, Fifteen days postinfection, VACV-specific total IgG (left panel) and IgG2c (right panel) levels in serum samples were quantified by endpoint dilution ELISA as described in the Materials and Methods. Each symbol represents one mouse. Plaque neutralizing Ab titers (PRNT50) were determined in serum samples as described in the Materials and Methods (B, left panel). Total VACV-immune serum from day 35 infected WT, CD28−/−, B7-1−/−, and B7-2−/− was pooled from multiple mice and then injected i.p (400 μl) into naive WT mice 1 d prior to i.n. challenge with lethal dose of VACV-WR (1 × 106 PFU/mouse). Animals were weighed daily and euthanized if weight loss was 25% body weight. Mean percentage of initial body weight is shown (right panel). Statistical significance is indicated by asterisks. The p values are <0.05 by two-tailed Student t test. During VACV infection, optimal levels of neutralizing Abs are detected at day 30 postinfection. The functional capacity of these Abs to neutralize VACV also was examined. Serum prepared from B7-2−/−, CD28−/−, and B7-1/2−/− but not B7-1−/− mice had significantly reduced capacities to neutralize VACV in vitro compared with serum from WT mice (Fig. 3B, left panel). After i.n. infection with VACV-WR, naive mice exhibit weight loss and death within 6–9 d (22, 31), and VACV-immune serum can afford protection in this model (24, 31). Thirty-five days postinfection, serum was prepared and transferred i.p into groups of naive WT mice. The following day, all mice were challenged with a lethal i.n. dose of VACV-WR and weight loss was monitored for 7 d (Fig. 3B, right panel). All mice that received serum from VACV-infected WT or B7-1−/− mice exhibited substantial protection from death. In addition, weight loss (10–15%) was much less severe in these mice. Most significantly, in WT mice that received serum from VACV-infected B7-2−/− and CD28−/− mice, no protection was evident, and all succumbed to the infection. Together, these results show that B7-2/CD28 interaction is critical for the development of neutralizing and protective Ab responses to VACV. Next, we performed kinetic blocking experiments in which WT mice received a nondepleting anti–B7-2–blocking Ab on 4 consecutive d starting on days 1, 5, or 9 after the initial infection (Fig. 4). The most dramatic effect (70% reduction) on the numbers of activated (B220+IgDlow; Fig. 4A) and GC B cells (PNA+FAS+; Fig. 4B) was seen when CD28/B7-2 interactions were inhibited starting from an early time (days 1–4). However, starting anti–B7-2 treatment at later times (day 5 or 9) after effector T cell populations develop still reduced the response by 60 and 35%, respectively, suggesting that sustained interactions between CD28 and B7-2 beyond the time of initial encounter with Ag was essential for maintenance of the normal GC reaction. B7-2 plays an early and sustained role in acquisition of GC phenotype in response to VACV. WT mice were infected i.p with VACV-WR (2 × 105 PFU/mouse). On days 1–4, 5–8, and 9–11 postinfection mice were injected i.p. with 150 μg either control IgG or a nondepleting anti–B7-2-blocking Ab. Fifteen days postinfection, splenic mononuclear cells were harvested and stained for B220, IgD, FAS, and PNA. A, Representative plots depicting the expression of IgD on B220+ cells. Percentages of B220+IgDlow cells are indicated. B, Representative plots showing the expression of PNA+FAS+ within the IgD−B220+ gated population. Percentages of GC (PNA+FAS+) B cells are indicated. The Bcl6 proto-oncogene encodes a transcriptional repressor required for the development of GCs and Ab affinity maturation (32). Bcl6 protein is expressed by GC B cells but not by naive pre-GC B cells or post-GC memory and plasma cells (32). This raised the possibility that CD28 interacting with B7-2 expressed on B cells may influence the expression of Bcl6 during normal GC development. To test this hypothesis, we infected mice with VACV-WR and on day 8 postinfection detected intracellular Bcl6 expression in B cells by multicolor flow cytometry. As shown in Fig. 5, WT IgDlow B cells readily upregulated expression of Bcl6 protein in response to VACV-WR infection. In striking contrast, B7-2−/− and B7-1.2−/− B cells failed to upregulate Blc6 expression, directly correlating with severely diminished GC reaction seen in these mice. B7-2 is required for optimal BCL-6 expression in activated B cells in response to VACV. WT, B7-2−/−, or B7-1/2−/− mice were infected i.p with VACV-WR (2 ×105 PFU/mouse). Eight days postinfection, splenocytes were harvested and stained for B220, IgD, and intracellular BCL-6. Representative histograms depicting the expression of BCL-6 on IgDhigh (top panel) and IgDlow (bottom panel) within the B220+ gated population. Percentages of BCL-6+ B cells are indicated. To determine whether the differential effects of B7-1 versus B7-2 on TFH development and the subsequent B cell responses reflected the relative levels of these molecules on B cells, we examined B7-1 and B7-2 cell surface expression on B cells postinfection with VACV-WR. In naive mice, B7-2 is constitutively expressed on ∼20% of B220+IgD+ cells at low levels, whereas little or no detectable B7-1 is present on this population (Fig. 6A). The level of B7-2 expression was increased on both IgDlow and IgDhigh B cell populations after VACV-WR infection (Fig. 6B, right panel). In contrast, expression of B7-1 did not appreciably increase on B220+ cell populations regardless of IgD expression levels in VACV-WR–infected mice (Fig. 3B, left panel). These results indicate that VACV infection selectively leads to upregulation of B7-2 expression on B cells. This further suggested that interactions through CD28 expressed on pre-GC TFH cells and B7-2 on follicular B cells might be essential for B cell–T cell communication that generates the GC reaction. Differential cell-surface expression of B7-1 and B7-2 molecules on B cells. A, Representative plot depicting B7 expression on B220+ cell from naive WT mice. Percentages of B220+ cells positive for B7-1 and B7-2 are indicated within the plots. B, WT, B7-1−/−, and B7-2−/− mice were infected i.p with VACV-WR (2 ×105 PFU/mouse). Eight days postinfection, splenocytes were harvested and stained for B220, IgD, B7-1, and B7-2. Dot plots represent the percentage of B7-1+ B220+ (left panel) or B7-2+ B220+ (right panel) within the indicated IgD population in WT, B7-1−/−, and B7-2−/− mice. Similar results were obtained in at least two separate experiments. To determine whether B7-1/B7-2 were involved in the delivery of T cell signals directly to B cells, we developed three separate but complementary strategies. In our first approach, groups of WT and B7-1/2−/− mice were infected with VACV-WR and 1 d later treated i.p with an agonistic Ab to CD28. Our objective in this study was to bypass the requirement for DC and/or B cell expressed B7 molecules during T cell priming and subsequent TFH development and then assess whether B7-1/2−/− B cells could differentiate into both GC B cells and plasma cells. Significantly, treatment with agonistic anti-CD28 restored both the percentages and absolute numbers of activated CD4 (Fig. 7A) and GC TFH cells (Fig. 7B) in those animals that lacked both B7-1 and B7-2. Anti-CD28 had no effect in CD28−/− mice and did not enhance T cell responses in WT mice above those induced by VACV (not shown). However, the development of GC B cells in the spleen of B7-1/2−/− mice was not markedly enhanced or restored to WT levels by anti-CD28 (Fig. 7C). This suggests that B7 ligation on a B cell is needed for acquisition of GC phenotype. 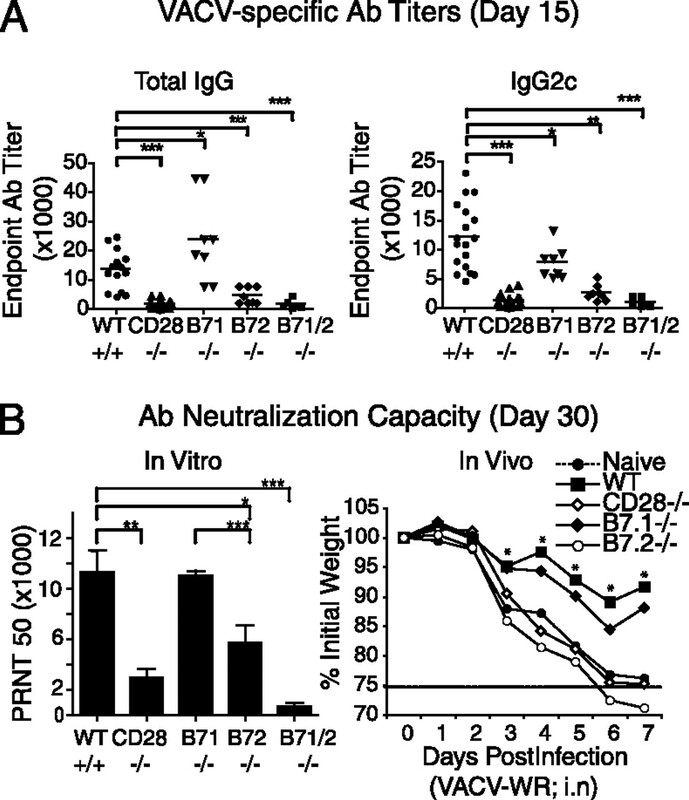 Anti-CD28 agonistic Ab restores T cell priming and acquisition of TFH but not GC B cell phenotype in B7-deficicent mice. WT and B7-1/2−/− mice were infected i.p with VACV-WR (2 × 105 PFU/mouse). Naive mice were used as control. One day postinfection, groups of B7-1/2−/− mice were treated i.p with 150 μg/mouse anti-CD28 agonistic Ab. At day 8 postinfection, splenic mononuclear cells were harvested and stained for CD4, CD44, CD62L, CXCR5, PD-1, and GL-7. A, Percentage (left panel) and absolute numbers (right panel) ± SEM of activated CD4+CD44+CD62Llow cells per spleen from four individual mice. Representative contour plots depicting GC TFH (CXCR5+GL-7+) cells (B, top panel) after gating on CD4+CD44highCD62Llow cells. Numbers indicate percentages of CXCR5+GL-7+–positive cells within the gated population. Total numbers of GC TFH (B, bottom panel) cells per spleen, determined as described in Materials and Methods. C, Representative contour plots of gated B220+ cells staining for PNA and FAS in spleen. Numbers indicate percentages of GC B (PNA+FAS+; C, top panel) after gating on B220+ populations. Percentage and absolute numbers ± SEM of GC B (PNA+FAS+; C, bottom panel) per spleen. Similar results were obtained in two separate experiments. Statistical significance is indicated by asterisks. The p values are <0.05 by two-tailed Student t test. Next we determined whether adoptive transfer of highly purified congenically marked (CD45.1) WT B cells into B7-2−/− mice (CD45.2) could restore the defective TFH differentiation as well as GC B cell phenotype that was evident in these mice (Figs. 1, 2). As a positive control, CD45.2+ WT mice were also reconstituted with CD45.1+ WT B cells. CD28−/− recipients were used as negative control. On day 8 following infection with VACV-WR, the percentage and absolute numbers of donor CD45.1+ B cells was found to be equivalent between WT and knockout recipients (Fig. 8A). As expected, transfer of WT CD45.1+ B cells into WT mice, which exhibit normal TFH development (Fig. 8B, 8C), resulted in downregulation of IgD (Fig. 8D, left panel) and acquisition of GC phenotype (Fig. 8E, left panel) at a frequency approximating that of endogenous B cells after VACV-WR infection (Fig. 8F, 8G, left panel). In contrast, the donor WT CD45.1+ B cells failed to form GC B cells in a CD28-deficient environment as compared with WT CD45.1+ B cells that were transferred into WT (CD45.2) mice (Fig. 8D, 8E, middle panel). This directly correlated with the severely diminished T cell priming and TFH development that is normally seen in CD28−/− mice (Fig. 8B, 8C). Significantly, transfer of WT (CD45.1) B cells into B7-2−/− mice partially restored acquisition of TFH phenotype (Fig. 8B, 8C) and permitted the activation (Fig. 8D, right panel) and development of GC B cells (Fig. 8E, right panel). Again, consistent with our results in Fig. 7, transfer of WT B cells into B7-2−/− mice failed to restore the capacity of endogenous B7-2−/− (CD45.2) B cells to form GCs (Fig. 8F, 8G, right panel), even though TFH phenotype was restored. Together these results suggest that B7-2 expressed on a B cell not only stimulates CD28 on a CD4 cell, but also is required in a cell-autonomous manner to the B cell to enhance acquisition of GC phenotype. WT B cells restore defective TFH development and acquire GC phenotype in B7-2–deficient host. A, MACS-purified CD19+ positive splenocytes (3 × 107 cells/mouse; purity >99%) from groups of congenically marked CD45.1+ WT mice were transferred i.v into groups of CD45.2+ WT, CD28−/−, and B7-2−/− mice. One day after adoptive transfer, mice were infected with VACV-WR (2.5 × 105 PFU/mouse). Splenocytes were isolated at day 13 postinfection. A, The contour plots represent the percentage of CD45.1+ donor cells gated on B220+ population. Numbers indicate percentages of B220+CD45.1+ double-positive cells within the gated population. Percentage (B) and total numbers (C) of TFH cells (CXCR5+PD-1+) after gating on CD4+CD44highCD62Llow per spleen. Statistical significance is indicated by asterisks (p values <0.05 by two-tailed Student t test). Representative contour plots depicting the expression of IgD on B220+ cells. Percentages of donor (D) and endogenous (F) B220+IgD+ and B220+IgD− cells are indicated. Representative plots showing GC staining (FAS+PNA+) after gating on IgDlow CD45.1+ donor (D) and CD45.1− endogenous (G) B220+ cells. Numbers indicate percentages of GC B (PNA+FAS+) after gating on B220+IgDlow populations. Similar results were obtained in two separate experiments. To demonstrate this more directly, we established an adoptive transfer model system in which only the donor B cells would lack B7 molecules, whereas endogenous B cells and all other APCs (DC and macrophages) would express B7 normally. Highly purified B cells from CD45.2+ WT and/or B7-1/2–deficient mice were adoptively transferred into groups of CD45.1+ WT mice, resulting in mice that expressed WT-T/WT-B or WT-T/WT-B and B7-1/2–deficient B cells. This strategy allowed us to directly compare the capacity of WT and B7-deficient B cells to differentiate to GC B cells or plasma cells in the same mouse. 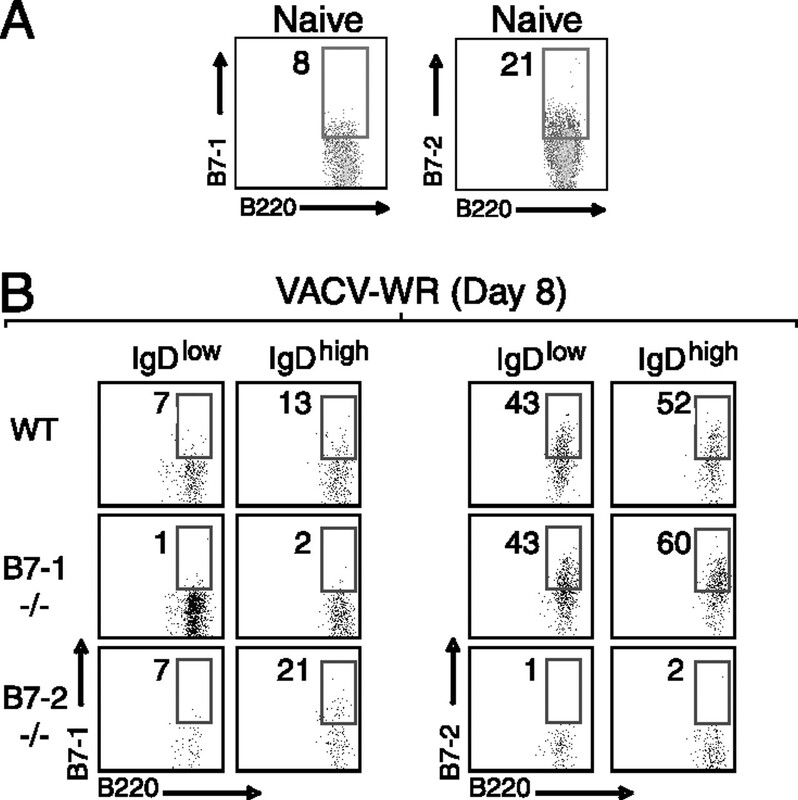 Equal numbers of donor B cells accumulated in the spleens 8 d following infection with VACV-WR (Fig. 9A). 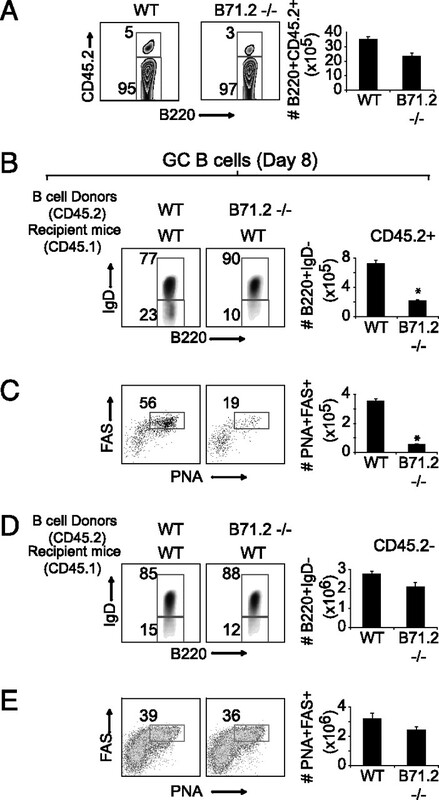 In striking contrast to donor WT B cells, the donor B7−/− B cells exhibited a profound defect in their ability to downregulate IgD (Fig. 9B) and differentiate into GC B (Fig. 9C) in the B7-sufficient environment. As controls, equivalent frequencies of endogenous B220+IgDlow B cells (Fig. 9D) and GC B cells (Fig. 9E) were generated in the WT mice that received B7-deficient B cells compared with WT mice that received WT B cells. This shows that optimal TFH help for differentiation of GC B cells requires B cell-autonomous expression of B7 molecules. B cell-autonomous expression of B7 is required for acquisition of GC B cell phenotype and plasma cell differentiation. A, MACS-purified CD19+ positive splenocytes (3 × 107 cells/mouse; purity >99%) from groups of CD45.2+ WT and B7-1/2−/− mice were transferred i.v. into CD45.1+ WT mice. One day after adoptive transfer, mice were infected with VACV-WR (2.5 × 105 PFU/mouse). On day 8 postinfection, splenocytes were harvested and stained for B220, CD45.2, IgD, PNA, FAS, and CD138. A, The contour plots represent the percentage of CD45.2+ WT or B7−/− donor cells gated on B220+ population. Numbers indicate percentages of B220+CD45.2+ and B220+CD45.2− cells within the gated population. Representative plots depicting the expression of IgD on B220+ cells. Percentages (left panels) and total numbers (right panels) of donor (B) and endogenous (D) B220+IgDlow cells are indicated. Representative plots showing GC staining (FAS+PNA+) after gating on IgDlow CD45.2+ donor (C) and CD45.2− endogenous (E) B220+ cells. Numbers indicate percentages of GC B (PNA+FAS+) after gating on B220+IgDlow populations. Representative contour plots of gated B220+ cells staining for the plasma differentiation marker CD138 in spleen. Numbers indicate percentages of plasma cells (IgDlow/CD138+; left panel) after gating on B220+ populations. Absolute numbers ± SEM of plasma cells (IgDlow/CD138+; right panels) per spleen. Statistical significance is indicated by asterisks. The p values are <0.05 by two-tailed Student t test. Similar results were obtained in two separate experiments. To our knowledge, the present study is the first systematic evaluation of B7 costimulatory requirements of humoral immune responses elicited by VACV. We demonstrate that B7-2 bidirectionally affects both T and B cells during Ab responses and that B7-2–dependent signals in both B and TFH cells strongly shape the magnitude and quality of B cell responses. Previous work in other viral models have shown that the absence of both B7-1 and B7-2 or CD28-mediated costimulation profoundly impacts the Ab response to vesicular stomatitis virus (18), HSV (19, 33), murine γ-herpesvirus 68 (17), and influenza (20), decreasing or abrogating class switching of the Abs. These studies, as well as those experiments reported in this study, support a critical role for CD28–B7 interaction in mediating antiviral humoral immune responses. However, it remained unclear how CD28-B7 contributed to optimal generation of Ab responses in the context of these virus infections. Our data demonstrate that the need for B7 molecules is different depending on the APC types and the stage of the immune response. Early in the response to VACV, likely at the level of naive CD4 T cell and DC communication, both B7-1 or B7-2 ligand interactions provide the required costimulatory signals that lead to optimal CD4 T cell activation and VACV-specific Th1 differentiation. This demonstrates that B7-1 and B7-2 have critical, overlapping functions in priming of CD4 T cells. Interestingly, we recently reported that B7-2 and not B7-1 interactions with CD28 are essential for optimal VACV-specific effector CD8 T cell responses (23). This implies that early in the response to VACV, CD4 and CD8 T cells use distinct DC subpopulations that differ in their expression and regulation of B7 molecules. Consistent with this, CD8α+ DCs, which are the main subset involved in direct priming of VACV-specific CD8 T cells in vivo (34, 35) predominantly, express B7-2, whereas B7-1 is minimally induced on this population after VACV infection (23). In contrast, VACV-infected CD4+ DCs are the major subset that express both B7-1 and B7-2 (23). Whether this likely explains the use of B7-1 and B7-2 to costimulate CD28 and to promote optimal generation of VACV-specific effector Th1 cells requires further investigation. We show that in contrast to Th1 cell differentiation, CD28 interactions with B7-2 and not B7-1 are essential for development of TFH cells that control GC formation and Ab production. 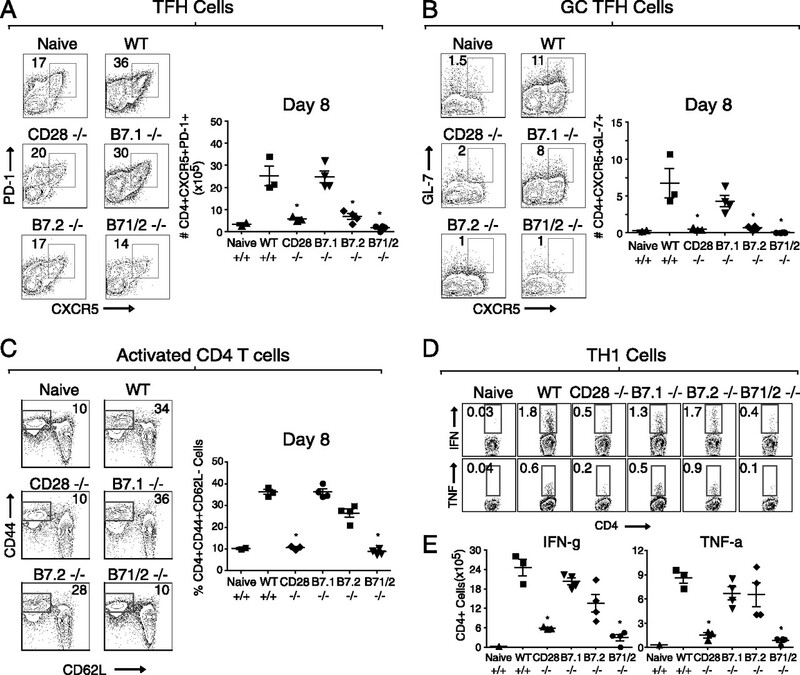 Migration of the primed CD4 T cells to the T–B border of the lymphoid tissues allows the critical B cell-dependent phase of TFH differentiation. Previous studies found that TFH differentiation is severely defective in B cell-deficient mice after protein immunization, viral infection, or parasite infection (12, 29, 36). This can be corrected by overexpression of the TFH lineage transcription factor, Bcl-6, suggesting that interaction of pre-GC TFH and B cells is important for Bcl-6 upregulation and lineage commitment to GC TFH (12). The differential effect on Th1 versus TFH observed in B7-2−/− mice in the context of VACV infection implies that B7-2 expressed on B cells becomes the primary CD28 ligand required for maintenance of the TFH phenotype. This conclusion was further supported by data showing that adoptive transfer of WT B cells to B7-2−/− deficient mice restored the defective TFH differentiation as well as GC B cell phenotype that were evident in these mice and that the acquisition of GC B cell phenotype remained sensitive to disruption by anti–B7-2 Ab even after day 5 of the response to VACV. Together these results suggest that sustained CD28–B7-2 interactions beyond the time of initial encounter with DC are essential for maintenance of the TFH and GC phenotype. Multiple factors might contribute to the differential requirement for B7-1 and B7-2 on B cells. Initial thoughts were that B7-2 was the major ligand for CD28 and B7-1 for CTLA-4 based on differential expression and binding affinities. Therefore, one possibility was that B7-1 binding to CTLA-4 might transmit inhibitory signals. However, we found that CTLA-4 was not involved in the response to VACV (S. Salek-Ardakani, unpublished observations). Thus, we think that the relative expression of B7-1 versus B7-2 on B cells dictated their use, rather than differential binding to CTLA-4. B7-2 is constitutively expressed by B cells and strongly upregulated in response to VACV infection. In contrast, B7-1 is expressed at extremely low levels in naive B cells and is not induced by VACV. Previous studies have indicated that B7-1 expression can be readily induced by CD40, TLR, and proinflammatory cytokines on naive B cells. Conceivably, the relative expression of either molecule might be dependent on the viral load and/or inflammatory environment induced by VACV. Alternatively, GC B cells might have specific mechanisms in place to actively inhibit the upregulation B7-1. In support of this, most GC B cells express Bcl6 (32), and Bcl6 has been shown to directly prevent CD40-induced expression of B7-1 by GC B cells, but interestingly, other CD40 target genes (B7-2, CD54, CD11a/18, and CD23) are not significantly affected by Bcl6 expression (37). 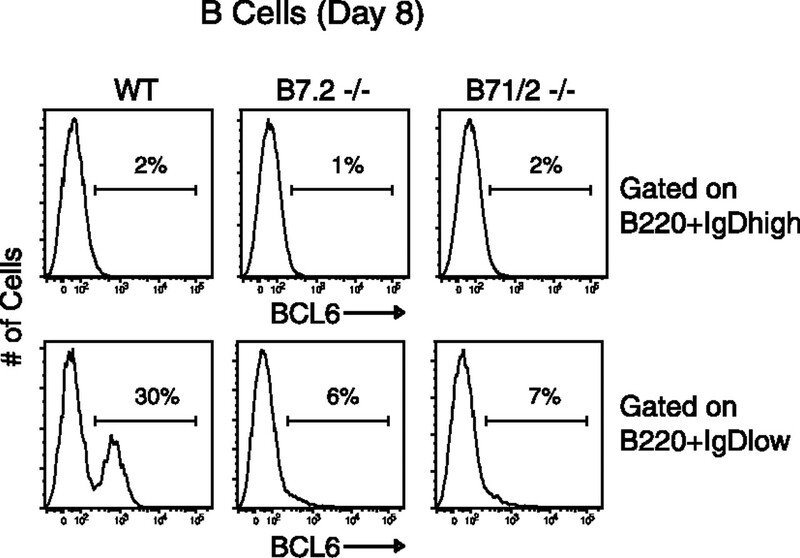 Consistent with a physiologic role for Bcl6 in suppressing B7-1, the expression of these two genes is mutually exclusive in B cells (37), and B7-2−/− (Bcl6-defective) mice show increased expression of B7-1 in B cells. The finding that Bcl6 controls B7-1 gene expression has implications for the role of Bcl6 and B7-2 in GC development. One possibility is that B7-1 might interact with the programmed death ligand 1 expressed by T cells and transmit inhibitory signals. Therefore, by controlling B7-1 expression in B cells, B7-2–dependent Bcl6 expression may enhance TFH cell function in GC. An important observation in our study is that B7-2 expressed on a B cell not only stimulates CD28 on a CD4 cell, but also is required in a cell-autonomous manner to the B cell to enhance acquisition of GC phenotype. This was shown through three independent approaches. First, treatment with agonistic anti-CD28 restored the defective development of TFH cells in B7-1.2 double-deficient mice but could not correct the development of GC B cells in the same animals. Second, adoptive transfer of WT B cells into B7-2−/− mice restored acquisition of TFH phenotype and permitted the donor B cells to differentiate into GC B cells. However, this failed to restore the capacity of endogenous B7-2−/− B cells to form GCs, even though TFH phenotype was restored. Third, the lack of B7 on B cells impaired their ability to differentiate into GC B in the B7-sufficient environment. Together, these results suggest that upregulation of B7-2 is a mechanism by which activated B cells directly affect local T-dependent B cells responses to VACV. Whether this reflects a requirement for direct B7-2 signaling to the B cell is not clear. Recent studies by several independent groups have provided strong evidence for a direct signaling role of B7-2 on activated B cells. Stimulation of B7-2 with either an anti–B7-2 Ab or CD28/Ig on an activated B cell increases the level of IgG1 (38, 39), IgG2a (40), IgE, and IgG4 protein (41) and differentially affects the level of antiapoptotic and proapoptotic factors expressed (40). B7-2 stimulation on murine B cell increases the activity of PI3K and the phosphorylation of phosphoinositide-dependent kinase-1, Akt, and IκB kinase αβ (39, 42). In addition, B7-2 stimulation induces an increase in the phosphorylation of phospholipase Cγ2 and protein kinase C αβ (39, 42). B7-2–mediated activation of these two signaling pathways leads to NF-κB activation (39, 42). Any of these downstream effects of B7-2 signaling may explain the requirement for cell-autonomous expression of B7-2 in the context of VACV infection. However, an equally plausible explanation of our data is that B cell-autonomous expression of B7-2 may be necessary for sustained productive cognate interaction with CD28-expressing CD4 T cells, a role that would not necessarily require B7-2 signaling. Thus, without B7-2 expression by the specific B cell, the relevant T cell help is not delivered, even if TFH are induced by another B cell or through anti-CD28. In summary, the importance of B7-CD28–mediated costimulation for the induction of antiviral humoral immune responses has been well established. Our data add to the literature by demonstrating a distinct and biodirectional role for B cell-expressed B7-2 in the maintenance of TFH phenotype and the isotype-switched Ab response via the induction of GC B cells. This work was supported by National Institutes of Health Grants AI77079 (to S.S.-A. ), CA91837 and AI67341 (to M.C. ), and AI63107 and AI72543 (to S.C.) and by a fellowship from the Center for Infectious Disease at the La Jolla Institute for Allergy and Immunology (to S.S.-A.). This is publication number 1361 from the La Jolla Institute for Allergy and Immunology.
. 2006. Immunity and immunological memory following smallpox vaccination. Immunol. Rev. 211: 320–337. 2011. Smallpox vaccines: targets of protective immunity. Immunol. Rev. 239: 8–26.
. 2009. The smallpox vaccine induces an early neutralizing IgM response. Vaccine 28: 140–147.
. 2007. Single-cell dynamics of T-cell priming. Curr. Opin. Immunol. 19: 249–258.
. 2011. Follicular helper CD4 T cells (T(FH)). Annu. Rev. Immunol. DOI: 10.1146/annurev-immunol-031210-101400.
. 2006. B cell migration and interactions in the early phase of antibody responses. Curr. Opin. Immunol. 18: 278–285.
. 2010. Germinal center T follicular helper cell IL-4 production is dependent on signaling lymphocytic activation molecule receptor (CD150). J. Immunol. 185: 190–202.
. 2010. In vivo regulation of Bcl6 and T follicular helper cell development. J. Immunol. 185: 313–326.
. 2010. Signals that influence T follicular helper cell differentiation and function. Semin. Immunopathol. 32: 183–196.
. 2000. Co-stimulation and selection for T-cell help for germinal centres: the role of CD28 and OX40. Immunol. Today 21: 333–337.
. 1997. B7-1 and B7-2 have overlapping, critical roles in immunoglobulin class switching and germinal center formation. Immunity 6: 303–313.
. 1996. CD28 is required for germinal center formation. J. Immunol. 156: 4576–4581.
. 2002. CD28(-/-) mice show defects in cellular and humoral immunity but are able to control infection with murine gammaherpesvirus 68. J. Virol. 76: 3049–3053.
. 2000. B7 costimulation is critical for antibody class switching and CD8(+) cytotoxic T-lymphocyte generation in the host response to vesicular stomatitis virus. J. Virol. 74: 203–208.
. 2001. Role of CD28/CD80-86 and CD40/CD154 costimulatory interactions in host defense to primary herpes simplex virus infection. J. Virol. 75: 612–621.
. 2002. Temporal segregation of 4-1BB versus CD28-mediated costimulation: 4-1BB ligand influences T cell numbers late in the primary response and regulates the size of the T cell memory response following influenza infection. J. Immunol. 168: 3777–3785.
. 2007. Vaccinia virus-specific CD4+ T cell responses target a set of antigens largely distinct from those targeted by CD8+ T cell responses. J. Immunol. 178: 6814–6820.
. 2008. OX40 drives protective vaccinia virus-specific CD8 T cells. J. Immunol. 181: 7969–7976.
. 2009. Preferential use of B7.2 and not B7.1 in priming of vaccinia virus-specific CD8 T cells. J. Immunol. 182: 2909–2918.
. 2005. Vaccinia virus H3L envelope protein is a major target of neutralizing antibodies in humans and elicits protection against lethal challenge in mice. J. Virol. 79: 11724–11733.
. 2008. Therapeutic targeting of the BCL6 oncogene for diffuse large B-cell lymphomas. Leuk. Lymphoma 49: 874–882.
. 2002. Recombinant vaccinia virus-induced T-cell immunity: quantitation of the response to the virus vector and the foreign epitope. J. Virol. 76: 3329–3337.
. 2011. The TNFR family members OX40 and CD27 link viral virulence to protective T cell vaccines in mice. J. Clin. Invest. 121: 296–307.
. 2008. Germinal centres: role in B-cell physiology and malignancy. Nat. Rev. Immunol. 8: 22–33.
. 2002. B7 costimulation plays an important role in protection from herpes simplex virus type 2-mediated pathology. J. Virol. 76: 2563–2566.
. 2007. Vaccinia virus infection of mature dendritic cells results in activation of virus-specific naïve CD8+ T cells: a potential mechanism for direct presentation. Virology 359: 349–361.
. 2009. T follicular helper cells differentiate from Th2 cells in response to helminth antigens. J. Exp. Med. 206: 991–999.
. 2003. BCL6 controls the expression of the B7-1/CD80 costimulatory receptor in germinal center B cells. J. Exp. Med. 198: 211–221.
. 2000. Stimulation of the B cell receptor, CD86 (B7-2), and the beta 2-adrenergic receptor intrinsically modulates the level of IgG1 and IgE produced per B cell. J. Immunol. 165: 680–690.
. 2007. CD86 regulates IgG1 production via a CD19-dependent mechanism. J. Immunol. 179: 1516–1523.
. 2002. Distinct role of CD80 and CD86 in the regulation of the activation of B cell and B cell lymphoma. J. Biol. Chem. 277: 7766–7775.
. 1997. CD86 (B7-2) on human B cells. A functional role in proliferation and selective differentiation into IgE- and IgG4-producing cells. J. Biol. Chem. 272: 15613–15619.
. 2006. CD86 stimulation on a B cell activates the phosphatidylinositol 3-kinase/Akt and phospholipase C gamma 2/protein kinase C alpha beta signaling pathways. J. Immunol. 176: 6727–6735.